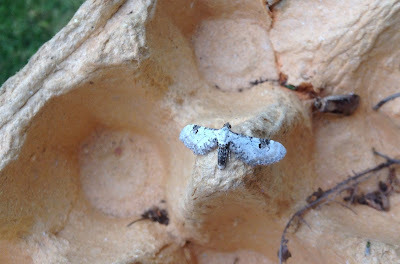 Caterpillar breeding has reached unprecedented levels of care and volume here, and in the various foster-families who are kindly rearing infants from eggs laid by moths which visited my trap earlier in the year. After four seasons of Emperor Moth breeding, which I much enjoyed, I managed to find homes for all the brood hatched this Summer, and they are causing much interest and excitement. 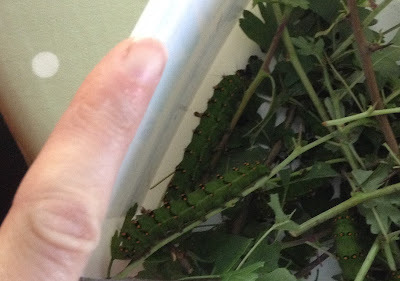 The caterpillars have been fine and are enormous! They are scoffing piles of hawthorn and seem equally happy with brambles. They had a trip out on Tuesday to see the class I am volunteering with. By a stroke of luck they were doing insect life cycles and they were really interested. 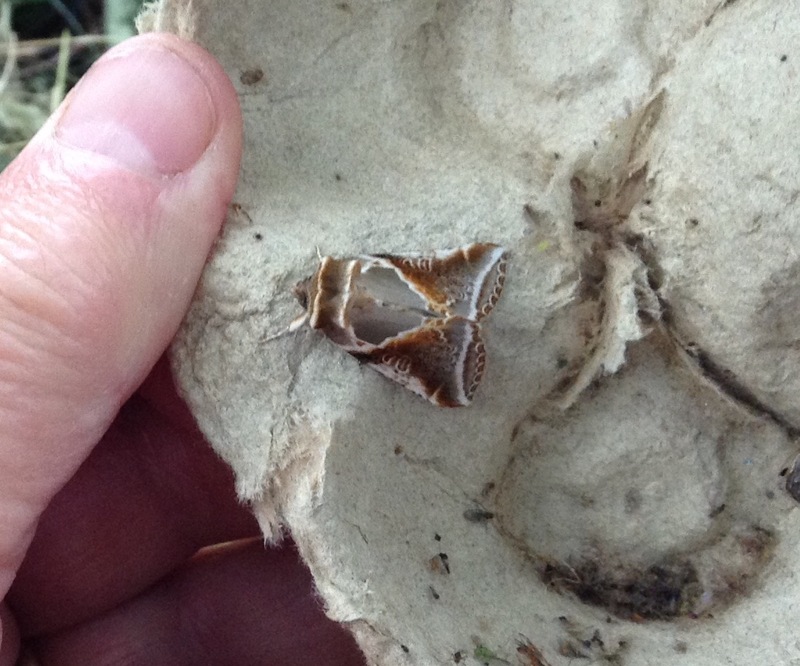 Some good questions came up, such as: do the different thicknesses of stripe denote male and female? And: why don’t they get prickled on the thorns because they have soft bodies? Do they shed their skins as well? I thought I had killed them the day after you left when there was this shrivelled skin but there were still six alive and well so I imagine that’s what it was. Finally, the Bedford family in Oxford, who have another branch of the Emperor family, are kindly offering me eggs of an Eyed Hawk which was found mating with its partner by a colleague of Tom B. I'm hoping to sort out a pick-up this weekend; and so the saga will go on. It brings back memories of my own excitement when my brother and I bred Elephant Hawks successfully as children (and had the same heart-stopping moment when I first saw their shed, shrivelled skins). 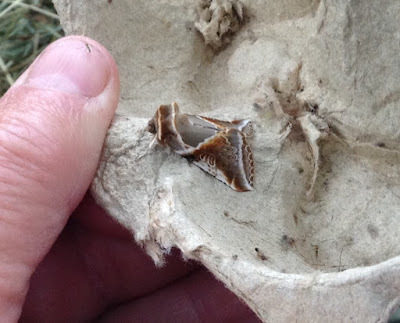 And if any of this year's keepers can be present when the moths eventually emerge from their pupae, that is an unforgettable sight. Partly for its strangeness and beauty and partly, as my granddaughter observes with great emphasis after seeing a hatch at the Natural History Museum in Kensington: "Grandpa, do you know? The FIRST thing it did was a huge WEE!" 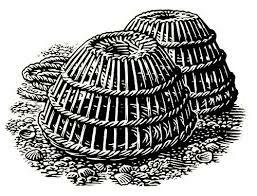 Back in the garden, I have lit the trap for the first time since we got home from holiday. Showing signs of my age, I went outside an hour or so later when the grandchildren and their Mum and Dad arrived for the weekend, and was startled by the fact that our climbing roses seemed to be glowing. I actually got as far as getting the iPad and taking a photo before realising that the eerie and rather lovely effect was caused by my sighting of the trap right behind the wall. There it is, above. 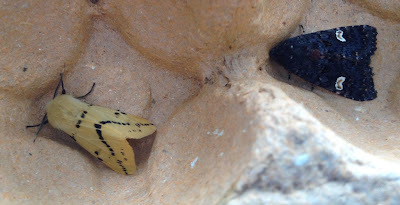 There were some nice moths inside, including the Swallowtail above - in good condition for a large and fragile moth which often gets a battering and tattering early in its short life, judging by the condition of many of those which come to my light. 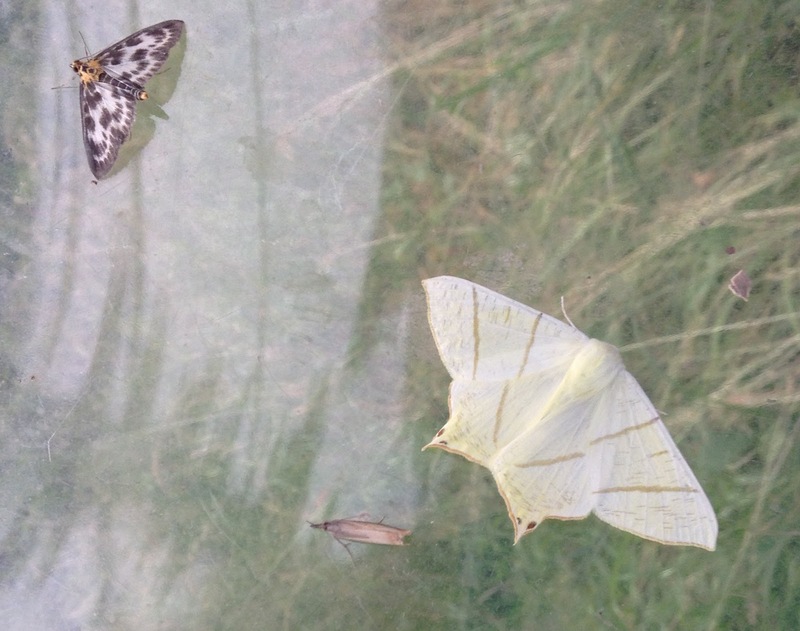 Below we have a Buff Ermine and a handsome example of the darkest version of that very variable moth, the Common Rustic. 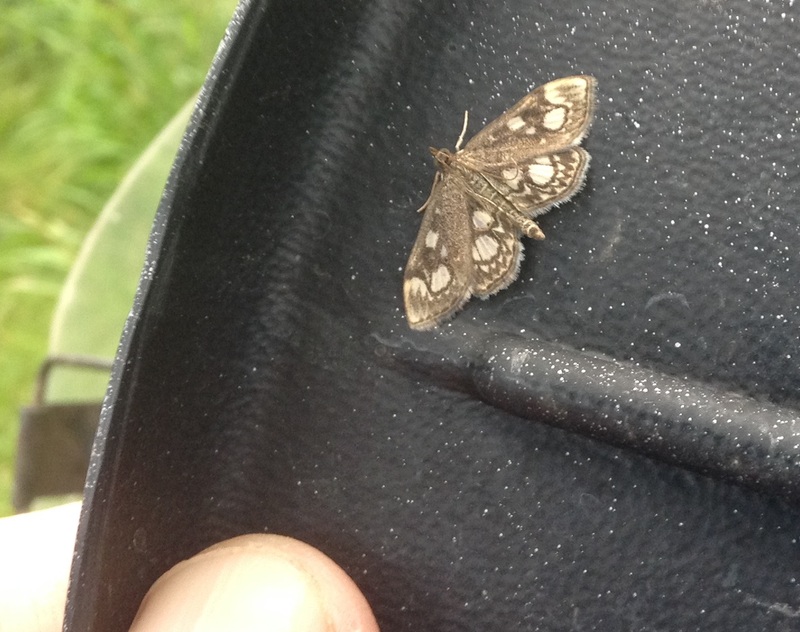 Finally, another favourite: the small (observe my ubiquitous thumb comparator) but very attractive micro Anania coronata. Penny and I have just had a lovely week in southern Greece, re-aquainting ourselves with the Swallowtails and Scarce Swallowtails whose abundance on Continental Europe thrilled me on my first visits there as a teenager. I suppose that I am a bit blasé half a century later, so that they no longer turn my head. But I love to see them floating around above scented bushes or occasionally speeding away at top speed. Even after many visits, there is also much to stalk and hunt, and this time I was delighted to persuade a male Cleopatra, like a Brimstone but with striking orange blotches on its forewings, to settle for a while. They are almost as powerful flyers as the Swallowtails and much less prepared, at least in my experience, to stay still. They remind me, too, of a famous butterfly hoax which you can read about here. 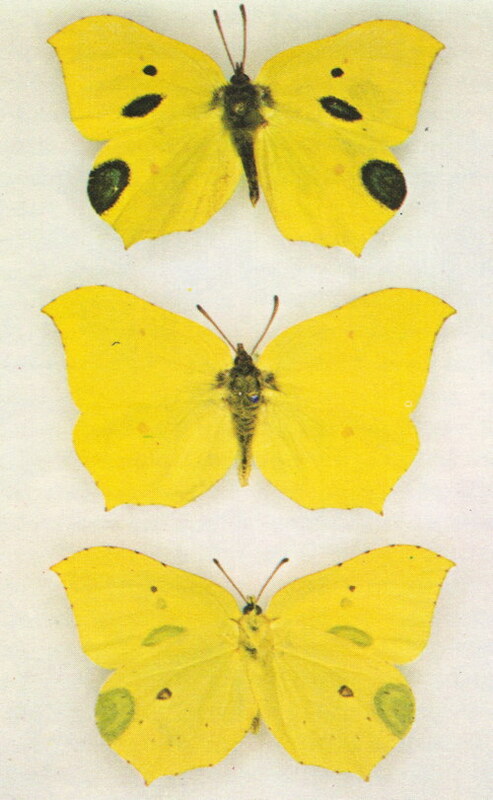 It involved the curious looking creatures top and bottom in the trio on the left (with a standard Brimstone in the middle). As my link describes, the painted fakes were declared to be a new species by Linnaeus but later unmasked by Fabricius - and you don't get more eminent among classifiers than those two. 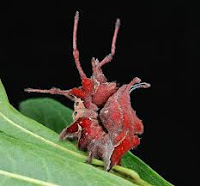 They were stamped on in a fury when they were exposed, but luckily a painstaking entomologist re-assembled them and they are now in the British Museum of Natural History in London. I was creeping about in search of Cleopatras when something even more orange caught my eye, at rest on a strongly-scented mauve shrub which grew in large bushes by the beach, a sort-of mixture between buddleia and spiraea. As I cautiously drew nearer, it upped and went, giving me time only to register it as some sort of Tiger moth. We have recently had Scarlet Tigers in Oxfordshire in their usual Summer abundance, but this was different. Ever-hopeful, I edged quietly to the other side of the bush and there it was, happily nectaring and happy to take part in a prolonged photo session which allowed me to take it from almost every angle. As I was doing so, another British couple came up and were extremely pleased to join in the photoshoot. In my little insect-hunting excursions from the beach, which was as colourful as the butterflies and moths in a different way, as you can see from the small photo left), I met half-a-dozen other enthusiasts for photographing butterflies and moths. Update: Many thanks for the Comment below - I completely forgot to add the vital fact that this is a Jersey Tiger, a moth which is notably disloyal to its name. I even had one in Leeds. Abroad it has different titles, for example L'Ecaille chinée in France, or the Chinese Tortoiseshell. The moth is famous in Greece for swarming at the 'Valley of the Butterflies' on Rhodes which is one of the island's most heavily-promoted attractions. 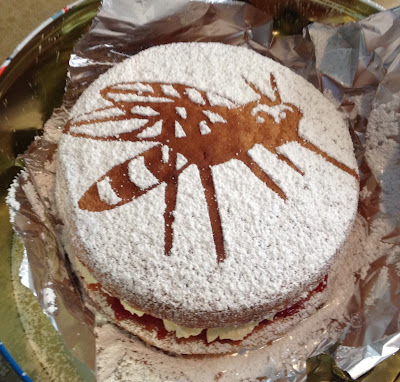 Not to mention other insects. The village and its surrounding countryside were full of curious creatures. The ghostly-green grasshopper above was bestriding a small shrub which the custodian of an old castle had planted amid the dusty ruins, one of a number of plants which he was carefully watering when we arrived. 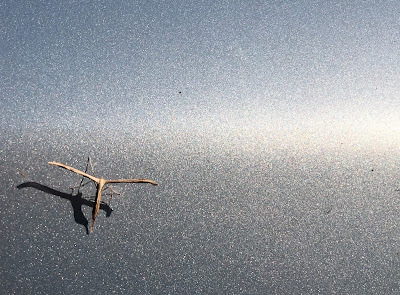 He had missed this one out and when we asked why, he said: "I do not like bugs." Thus we discovered the beautiful - and harmless - creature. 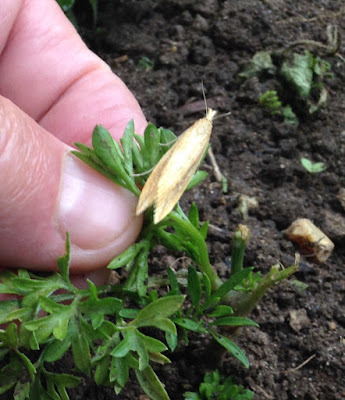 He still preferred to keep away, so Penny watered the plant for him, so skilfully that (admittedly rather to his dismay), the grasshopper stayed put. Here are some composite photos of other finds, with a couple of Scarce Swallowtails above, each missing a different tail, plus a glorious version of the Comma butterfly. 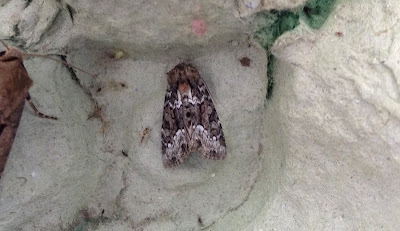 It seemed brighter and quite a lot larger and I must check if there is a Continental species different from our own. More of the same, above and below, including our own Swallowtail - not that many of us are likely to see it here in the UK - and a sinister-looking spider, top left below, balanced by a tiny wooden ladybird which we found in the village street. 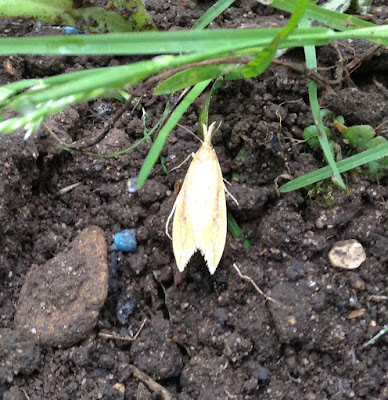 I put the trap under a large and fragrant mock orange last night, a shady spot where I seldom try to trap. The results were little different from recent catches in other parts of the garden: three Elephant Hawks which are very common at the moment, and a large assortment of Buff Ermines, Hearts and Darts, Small Magpies and other visitors. 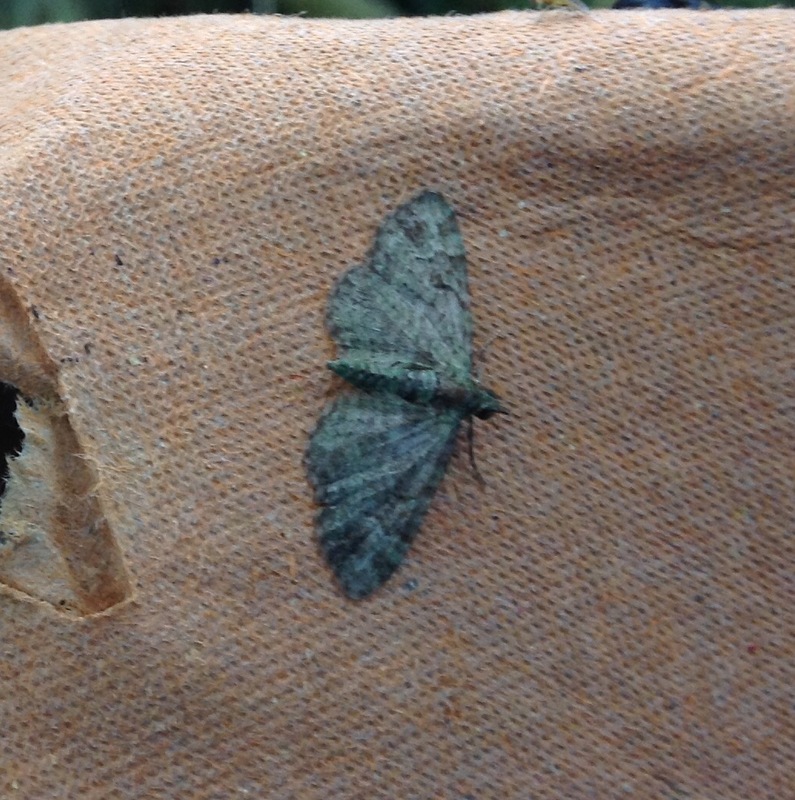 One very small arrival caught my eye: the Lime-speck Pug, above. There were also two contrasting examples of the micro Udea olivalis. Looking at them, I think that the pair which I identified yesterday as L. utealis may be olivalis as well, so I am updating that. 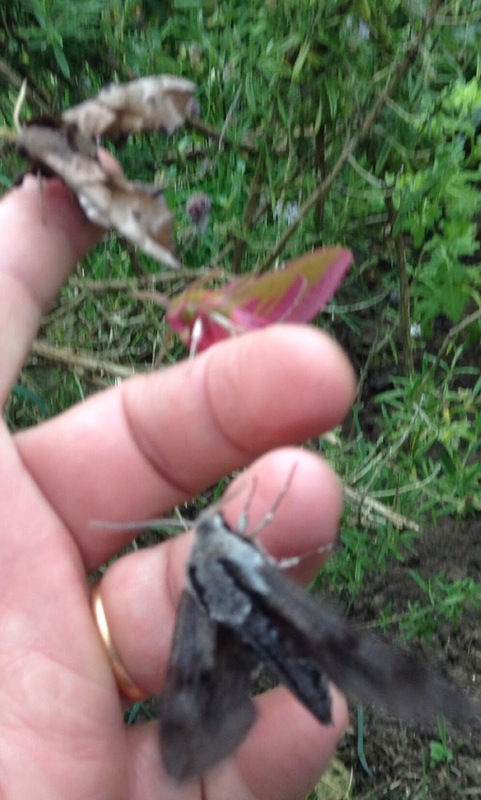 Both moths are common. We've been busy today entertaining friends for an afternoon themed on the Blandford Fly, one of the few serpents in our paradise (if I may mix my species and metaphors). The nasty little pest has pretty much shot its bolt for this year, but we were happy nonetheless to plunge a breadknife into its image on one of my famed superlight Victoria Sponge cakes. Our guests enjoyed the moth trap and took home three Elephant Hawk moths for local distribution. One of them asked me to identify a moth in a photo on his iPhone, a task which usually makes me quail because of my well-known inability to get challenging species right. This however was easy: a Lime Hawk, or actually two, happily mating on the garage doors of our friend's home in Oxford. Lime Hawks seem to be happy resting on walls during the day. When our older son was a student here, I remember him spotting one sunning itself on a wall in Jericho. 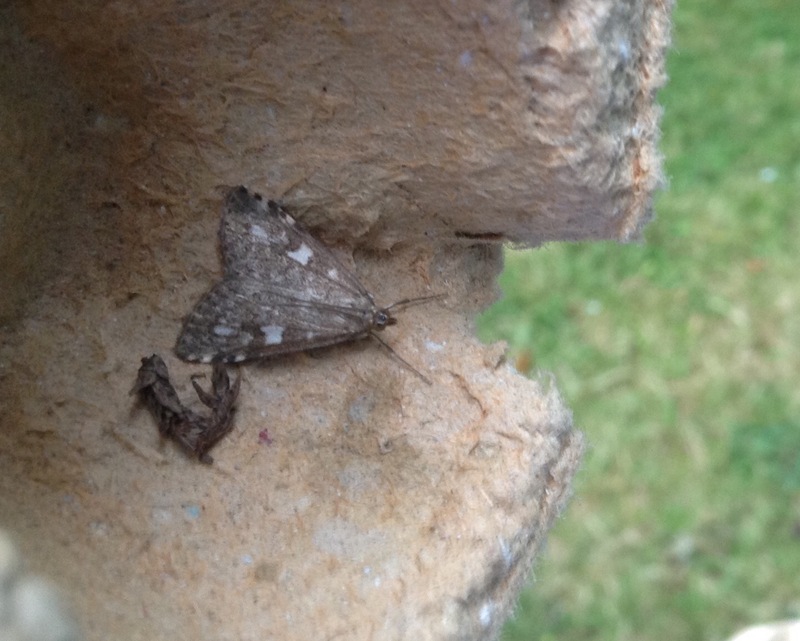 So to the moths and I reckon these two be: top row, Udea lutealis micro (Update: actually I think they are more likely L.olivalis - see next post), bottom left Large Nutmeg (I think), right, Turnip moth (I also think). 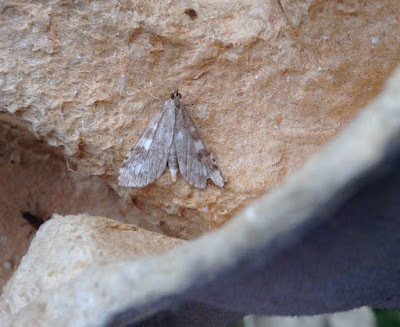 And below from top left clockwise: Shoulder-stripe Wainscot, Common Wainscot, Muslin Footman (always looks blurry, even allowing for my camera ineptness) and Grass Rivulet, a nice delicate little moth. 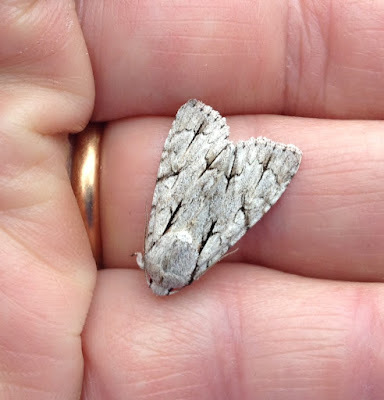 Then in the same order, we have: Coronet, Clouded Silver, Willow Beauty (I think) and a micro, perhaps an Acleris, about which I feel unsure. Update: see helpful comment for suggestions about this. Finally, another micro which I have nailed: Celypha striana. Help with my ums and ers is always greatly appreciated. 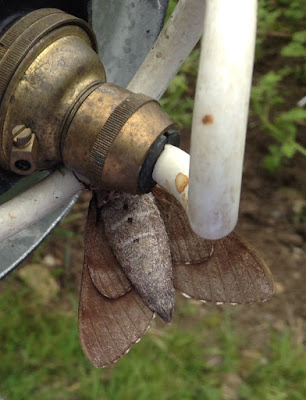 The moth trap works on the same principal as a lobster pot or crayfish trap, with a funnel tapering inwards to its narrower end to admit the insects whose sense of direction has been disorientated by the powerful light. 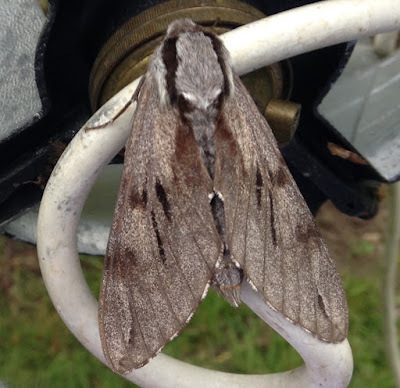 (Or so we think; the question of attraction and distraction is not yet fully resolved in spite of the great age of the saying 'like a moth to a flame'). Appropriately therefore, I caught a lobster yesterday morning - the fine moths shown below with its distinctive way of resting with its underwing petticoats peeping out on either side. Its grey is a little like an uncooked lobster's with that added flush of pink which might hint at the joys of a seafood dinner. But there the resemblance ends. Not so when it comes to the caterpillar, shown right. What an amazing feat of 'Keep Off!' camouflage - or whatever the opposite of camouflage is called, when the protection lies in the obvious but dangerous-looking and and unappetising appearance. A little greenery now: first a Green Oak Tortrix turning its tiny back on a Straw Dot, both pygmies but the first a micro and the second a macro, thanks to the arcane joys of moth classification. And next what I am pretty sure is a Green Pug because of the delicate greenish shade, though pugs are notoriously alike and difficult to distinguish, for me at least. 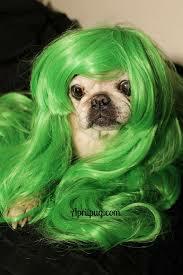 You may be amused to see what came up when I put 'green pug' into Goggle Images. Something to do with St Patrick's Day in the world of small dogs, apparently. I also have the chance, courtesy of Wednesday's visitors, to show you the effects of age on moths - probably a difference only of a week or two but the top picture, below, shows a pretty freshly-hatched Marbled Minor. 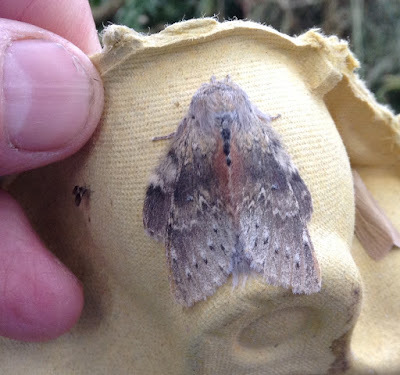 The second is of an older and somewhat careworn relative. 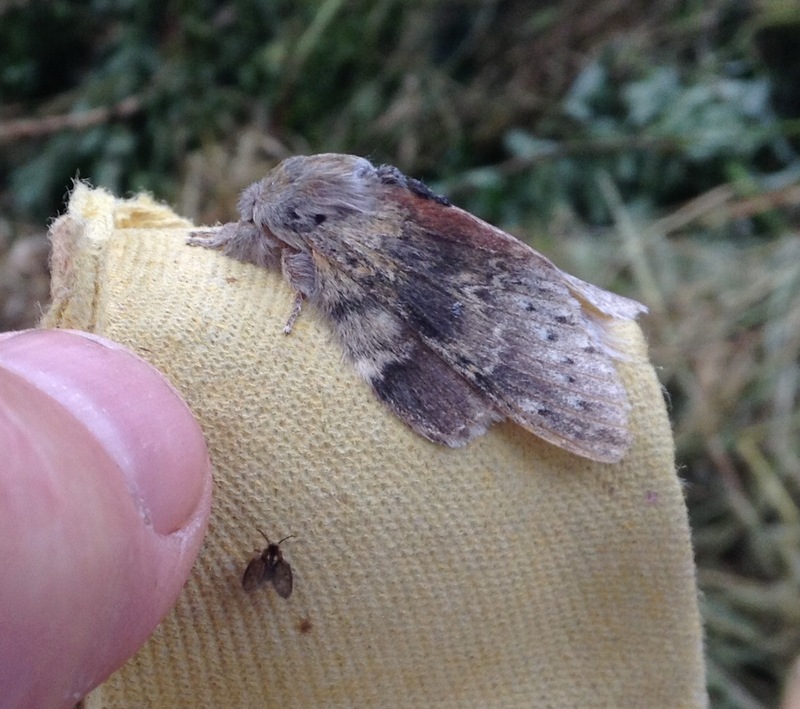 Finally, two favourites: the Buff Arches with its triangular resting habit very similar to that used by the Burnished Brass, plus the Arabic-looking squiggles on its wings - doubtless an example of confusion camouflage like the dazzle used on wartime ships. 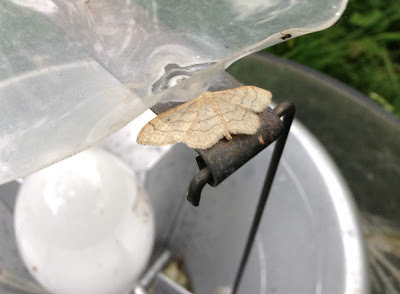 And the final picture shows a delicate Riband Wave, a moth which comes in two equally attractive forms; this one and a version where the space between the double lines is smoky beige. Things are humming along in the Imperial Caterpillar Nursery, with my charges now adding green and gold to their initial black-n-spiky appearance. 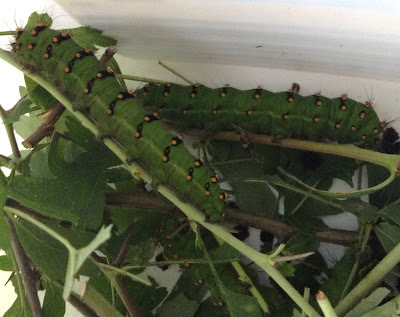 Their brothers and sisters are thought to be doing well in Headington, too, and further consignments are going off shortly to a neighbour's children, also in Oxford, and a stained glass artists and entomologist in Abingdon. 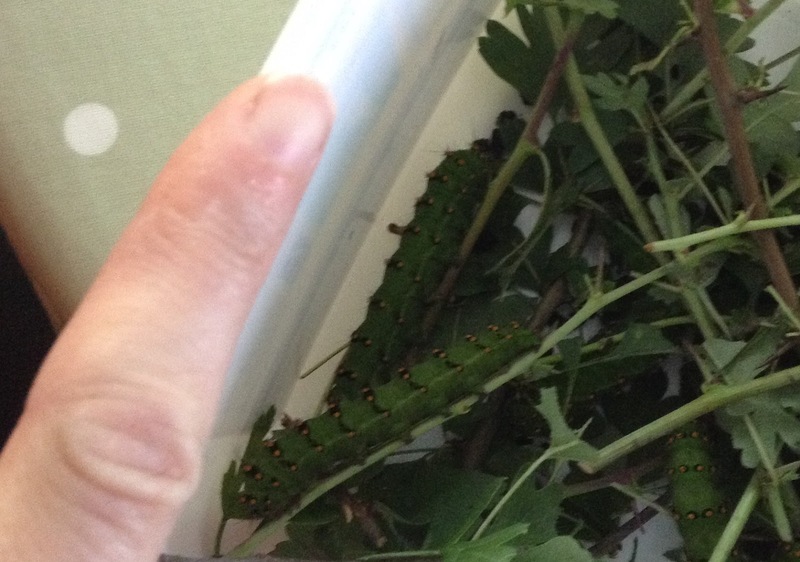 Feeding them on hawthorn has been a blessing compared with the willow which I have used previously. It stays fresher longer and grows all over the place round here. Picking it reminds me of my mother's insistence that we could eat it ourselves, when hungry on walks, and her claim that country people valued it so much that they knew it as 'bread and cheese'. It tastes like neither. Meanwhile, Penny and I have been down at the grandchildren's in London where the White Ermine Nursery is also flourishing, breeding the little creatures in the top picture of the composite above, from eggs laid by a female moth which my granddaughter (a tremendous fan of White Ermines) took home after her last visit here. The second picture, going clockwise, shows what these little creatures do to a dandelion leaf and the third is a mixture of caterpillar poos and the Mermaid's Jewels which are felt to be essential to the colony's well-being. My only slight concern is over the way that the catties are clustering on their ceiling, rather than being absorbed in the delicious replacement dandelions which we collected yesterday. Still, they made hay with the previous crop, so I cannot see why they shouldn't get back to munching again. We will all monitor the situation. Walthamstow where the grandchildren live is extremely urban but Londoners are very good with their gardens and parks and there is plenty of foliage for insects in scruffy and neglected corners. We are always spotting interesting things, the children especially with their fresh and hawk-like vision. Above for example is a Plume moth with its umbrella-furled wings, sunning itself on a parked car. Finally, we spotted this interesting spider while playing in the garden. I will Google 'white spider' but if any passing arachnophile recognises the species, please let me know. Update: and very many thanks to ace entomologist and stained glass artist Vikki Rose for telling me that this is a Crab Spider. They are fascinating creatures which don't make webs (although they can produce silk) but lie in wait in foliage and ambush prey with their crab-like front legs. Their ability to scuttle sideways also accounts for their species name. You can read more about them here - and many thanks again to Vikki. 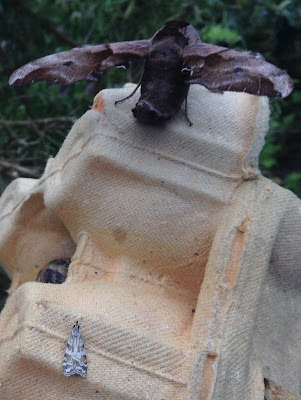 Two natty dressers arrived on Monday night before we headed south to do our duty with the grandchildren, one of them the lovely, almost pristine Pine Hawk shown above - topside - and below - underwings. This was a hawk moth I never saw in Leeds but one at least comes to the trap here every year. They are often in a rather battered state because the Pine Hawk is much nervier than most of its fellows and flies fast and furiously. I should have remembered this when sorting my posed third shot with the Elephant and Eyed Hawks; by the time, I got organised, the Pine Hawk was whirring its wings in readiness for take-off. Very shortly after I took my blurry photo, it duly scarpered. The Eyed Hawk was more accommodating as was the other natty visitor, the Grey Dagger shown below in the palm of my hand. 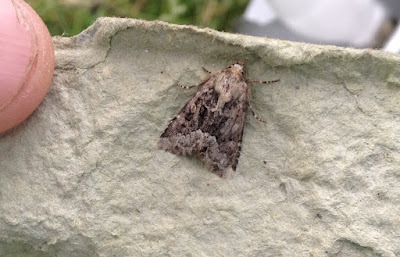 To round off with, a couple of micros: one large and very distinctive and I think Donacaula forficella; the other familiar but awaiting ID when I turn in tonight with the Micro-moth Bible.